Learn the basics of how to play the card game euchre. Read the paragraphs and click the "start learning" buttons under each table. If you're new to the game, try clicking 'multiple choice' for an easier learning mode. Euchre is usually played with four people, divided into two teams. All cards 2 through 8 are removed from the deck, and are never used. A game consists of playing "hands" until one team wins by getting 10 points or more. 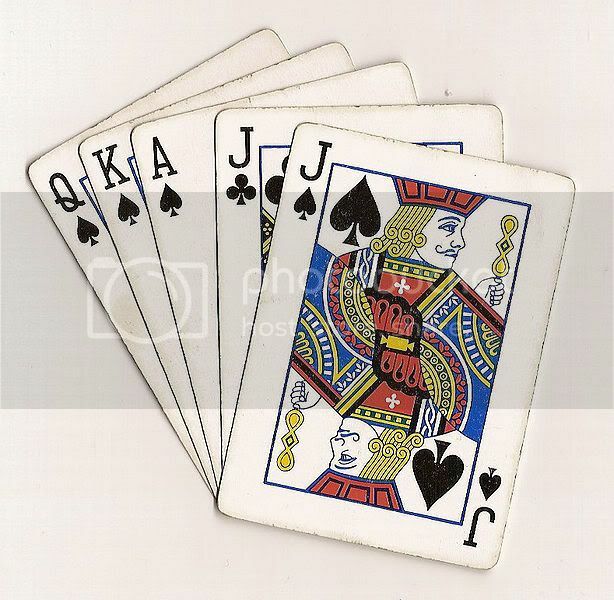 A hand consists of players being dealt 5 cards each, and then playing each card, in turn, until no cards remain. At the beginning of each hand, one of the suits (hearts, diamonds, spades, or clubs) is designated as "trump". The trump suit is the most powerful suit. After the dealer deals, he turns the first undealt card face-up. Each player (beginning with the player to the dealer's left and ending with the dealer himself) has a chance to tell the dealer to "pick up" this card. If this happens, the suit of this card becomes "trump" for the remainder of the hand. The dealer then puts this card into his hand and discards another. If the card was not picked up by the dealer, each player (beginning with the player to the dealer's left and ending with the dealer himself) has a chance to name one of the suits as trump. What do you say when you don't want the dealer to pick it up? "pass"
After trump is chosen, the person to the left of the dealer plays a card. Then all other players must play a card of the same suit, if they have one, or of any other suit if they don't. This is called "following suit". Generally speaking, the higher a card, the more powerful it is. If first player plays a K of hearts, the second player must play a heart (unless he has none). An Ace of hearts is more powerful than a K of hearts, so the second player should play it if he has it. If the second player plays a lower heart, it is less powerful than the K. If the second player plays another card that is not trump, it will be less powerful, even if it is higher. If the second player plays a trump card it will be more powerful. The remaining two players play a card, in turn, and the team whose player has played the most powerful card "wins the trick". There are 5 tricks per hand (since there are 5 cards per hand and you play 1 card for each trick). Whereas normally the higher a card is the more powerful it is, trump cards deviate from this somewhat. The highest trump card is the jack of the trump suit. The second highest trump card is the Jack of the other suit of the same color, which can be confusing to those learning euchre. That is, if clubs are trump, the J of clubs is the most powerful trump card, and the J of spades is the second most powerful trump card. The third is the A of clubs, and then all the lower clubs in turn. The jack of the trump suit is called the "Right Bower" and the jack of the other same-colored suit is called the "Left Bower". The team who calls trump gets 2 points if they take all 5 tricks, or 1 point if they take 3 or 4 tricks. If they take 2 or fewer tricks, the other team has "euchred" them and wins 2 points. If a player's hand is really good when they name trump, they can "go alone". This means their partner doesn't play for that hand. When going alone, if you get all 5 tricks, you get 4 points. "ordering up" the card telling the dealer to "pick it up"